The green flag of the Libyan Arab Jamahiriya was the only national flag in the world with just one color. 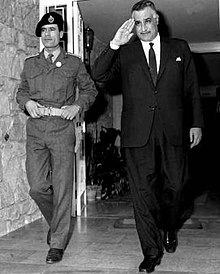 5.2.1 Gaddafi as permanent "Leader of the Revolution"
7.1 Political repression and "Green Terror"
Gaddafi (left) with Egyptian President Gamal Abdel Nasser in 1969. The Flag of the Libyan Arab Republic (1969–1972). The Coat of the Libyan Arab Republic (1969–1972). Nations no longer recognizing (dark blue) the Great Socialist People's Libyan Arab Jamahiriya as the legitimate government of Libya. Nations that have informal relations with the National Transitional Council, but retain formal relations with the Jamahiriya, are in light blue. Nations in pink have opposed recognition of the National Transitional Council, but have not yet made a formal statement that they will not recognize it. Nations in dark red have refused to recognize the NTC, and only maintain relations with the Jamahiriya. Nations in light gray have not yet expressed a position on which government is the legitimate one. ↑ أ ب "Libya: History". GlobalEDGE (via Michigan State University). اطلع عليه بتاريخ 14 أغسطس 2011. ^ "Housing". Encyclopædia Britannica. اطلع عليه بتاريخ 14 أغسطس 2011. ^ "African Countries by GDP Per Capita > GDP Per Capita (most recent) by Country". NationMaster. اطلع عليه بتاريخ 24 يوليو 2011. ^ "Comparative Criminology – Libya". Crime and Society. اطلع عليه بتاريخ 24 يوليو 2011. ^ Genugten، Saskia van (2016-05-18). Libya in Western Foreign Policies, 1911–2011 (باللغة الإنجليزية). Springer. صفحة 139. ISBN 9781137489500. ^ Crawford، Alex (23 March 2011). "Evidence Of Massacre By Gaddafi Forces". Sky News. تمت أرشفته من الأصل في 19 July 2012. اطلع عليه بتاريخ 25 أكتوبر 2011. ^ McGreal، Chris (2011-03-30). "Undisciplined Libyan rebels no match for Gaddafi's forces". The Guardian (باللغة الإنجليزية). ISSN 0261-3077. اطلع عليه بتاريخ 29 أبريل 2017. ^ "Western nations step up efforts to aid Libyan rebels". Washington Post. اطلع عليه بتاريخ 29 أبريل 2017. ^ "America's secret plan to arm Libya's rebels". The Independent (باللغة الإنجليزية). 2011-03-07. اطلع عليه بتاريخ 29 أبريل 2017. ^ "France sent arms to Libyan rebels". Washington Post. اطلع عليه بتاريخ 29 أبريل 2017. ↑ أ ب ت ث ج "Libya - Qadhafi". اطلع عليه بتاريخ 16 مايو 2016. ^ "Libya – Qadhafi". Countrystudies.us. 1970-06-11. اطلع عليه بتاريخ 15 سبتمبر 2013. ↑ أ ب ت "Significant Events in U.S.-Libyan Relations". 2001-2009.state.gov. اطلع عليه بتاريخ 15 سبتمبر 2013. ^ "Transcript of talk between Henry Kissinger and Golda Meir, March 1, 1974" (PDF). تمت أرشفته من الأصل (PDF) في 22 June 2012. اطلع عليه بتاريخ 24 يونيو 2012. ^ "Hermann Eilts to Department of State, January 25, 1976". اطلع عليه بتاريخ 09 يونيو 2011. ^ "Robert Carle (US Embassy in Tripoli) to Department of State, July 22, 1976". اطلع عليه بتاريخ 09 يونيو 2011. ^ "Hermann Eilts (US Ambassador to Egypt) to Department of State, August 9, 1976". اطلع عليه بتاريخ 09 يونيو 2011. ^ "Hermann Eilts to Department of State, August 11, 1976". اطلع عليه بتاريخ 09 يونيو 2011. ^ "Herman Eilts to Secretary of State, August 25, 1976". اطلع عليه بتاريخ 09 يونيو 2011. ^ "Anti-Gadhafi forces take over port in Sirte". CNN. 27 September 2011. تمت أرشفته من الأصل في 22 September 2011. ^ "ICL - Libya - Declaration on the Establishment of the Authority of the People". اطلع عليه بتاريخ 16 مايو 2016. 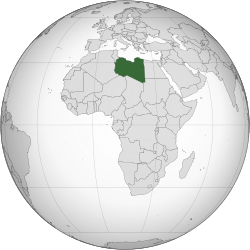 ^ "Libya – The Socialist People's Libyan Arab Jamahiriya". Countrystudies.us. اطلع عليه بتاريخ 15 سبتمبر 2013. ↑ أ ب ت ث ج ح خ د Eljahmi, Mohamed (2006). "Libya and the U.S.: Gaddafi Unrepentant". Middle East Quarterly. 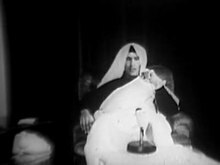 ^ "Gaddafi: Emancipator of women?". IOL. اطلع عليه بتاريخ 29 مارس 2016. ^ Prunier, Gérard. Darfur – A 21st Century Genocide. صفحة 44. ^ "judgment of the ICJ of 13 February 1994" (PDF). تمت أرشفته من الأصل (PDF) في 31 December 2004. اطلع عليه بتاريخ 08 يناير 2007. ^ "Eugene Register-Guard - Google News Archive Search". اطلع عليه بتاريخ 16 مايو 2016. ↑ أ ب Nolutshungu, S. p. 220. ^ de Waal، Alex (5 August 2004). "Counter-Insurgency on the Cheap". London Review of Books. 26 (15). ↑ أ ب "Libya Has Trouble Building the Most Deadly Weapons". The Risk Report Volume 1 Number 10 (December 1995). تمت أرشفته من الأصل في 20 April 2013. ↑ أ ب ت ث Khalil، Tahier. "Gaddafi made an enormest effort for Bhutto's release". Tahir Khalil of Jang Media Group. تمت أرشفته من الأصل في 21 October 2011. اطلع عليه بتاريخ 21 أكتوبر 2011. ^ "Lifetimesgroup News". اطلع عليه بتاريخ 16 مايو 2016. ^ Davis, Brian Lee (1990). Qaddafi, Terrorism, and the Origins of the U.S. Attack on Libya. صفحة 141. ↑ أ ب Bodansky, Yossef (1993). Target America & the West: Terrorism Today. New York: S.P.I. Books. صفحات 301–303. ISBN 978-1-56171-269-4. ^ Kelsey، Tim؛ Koenig، Peter (20 July 1994). "Libya will not arm IRA again, Gaddafi aide says". The Independent. London. اطلع عليه بتاريخ 01 سبتمبر 2011. ↑ أ ب ت ث ج ح Davis, Brian Lee. Qaddafi, Terrorism, and the Origins of the U.S. Attack on Libya. صفحة 183. ↑ أ ب Stanik, Joseph T. (2003). El Dorado Canyon – Reagan's Undeclared War with Qaddafi. ↑ أ ب Davis, Brian Lee (1990). Qaddafi, Terrorism, and the Origins of the U.S. Attack on Libya. صفحة 16. ↑ أ ب ت Farah, Douglas (4 March 2011). "Harvard for Tyrants". Foreign Policy. ↑ أ ب ت Chothia، Farouk (21 October 2011). "What does Gaddafi's death mean for Africa?". BBC News. اطلع عليه بتاريخ 29 أكتوبر 2011. ^ In a speech, Mandela said: "It was pure expediency to call on democratic South Africa to turn its back on Libya and Qaddafi, who had assisted us in obtaining democracy at a time when those who now made that call were the friends of the enemies of democracy in South Africa." SPEECH BY PRESIDENT NELSON MANDELA AT A LUNCHEON IN HONOUR OF MUAMAR QADDAFI, LEADER OF THE REVOLUTION OF THE LIBYAN JAMAHARIYA, Cape Town, 13 June 1999 نسخة محفوظة 12 June 2012 على موقع واي باك مشين. ^ Nwonwu، Fred (27 October 2011). "Remembering Gaddafi the hero". Daily Times of Nigeria. تمت أرشفته من الأصل في 17 June 2013. اطلع عليه بتاريخ 29 أكتوبر 2011. ^ "Harvard for Tyrants – By Douglas Farah". Foreign Policy. اطلع عليه بتاريخ 15 سبتمبر 2013. ↑ أ ب ت James Day (15 March 2011). "Revealed: Colonel Gaddafi's School for Scoundrels". Metro. ^ "How the Mighty Are Falling". The Economist. 5 July 2007. اطلع عليه بتاريخ 17 يوليو 2007. ^ "Gaddafi: Africa's king of kings". London: BBC News. 29 August 2008. اطلع عليه بتاريخ 14 فبراير 2010. ^ "Uganda bars Gaddafi kings' forum". London: BBC News. 13 January 2009. اطلع عليه بتاريخ 14 فبراير 2010. ^ Malone، Barry (2 February 2009). "Gaddafi pushes for union after election to head AU". Reuters UK. Reuters. اطلع عليه بتاريخ 02 سبتمبر 2011. ^ "Gaddafi vows to push Africa unity". London: BBC News. 2 February 2009. اطلع عليه بتاريخ 03 فبراير 2009. ^ "Saving the world economy from Gaddafi". Russia Today. 5 May 2011. اطلع عليه بتاريخ 29 أكتوبر 2011. ^ "'High-class terrorists running US, UK and France'". Russia Today. 21 October 2011. اطلع عليه بتاريخ 29 أكتوبر 2011. ↑ أ ب ت Davis, Brian Lee. Qaddafi, Terrorism, and the Origins of the U.S. Attack on Libya. صفحة 182. ↑ أ ب Geoffrey Leslie Simons. Libya: the struggle for survival. صفحة 281. ↑ أ ب ت ث ج ح "A Rogue Returns". Australia/Israel & Jewish Affairs Council. February 2003. تمت أرشفته من الأصل في 1 March 2003. ↑ أ ب Niksch, Larry (25 January 2002). "Abu Sayyaf: Target of Philippine-U.S. Anti-Terrorism Cooperation" (PDF). CRS Report for Congress. Federation of American Scientists. ↑ أ ب St. John؛ Ronald Bruce (1 December 1992). "Libyan Terrorism: The Case Against Gaddafi". The Contemporary Review. ^ Davie, Brian Lee. Qaddafi, Terrorism, and the Origins of the U.S. Attack on Libya. صفحة 186. ↑ أ ب ت The Middle East and North Africa 2003 (2002). Eur. p. 758. ↑ أ ب ت ث ج "Dictator's Useful Idiots Happy To Take His Money". The Australian. 24 February 2011. ^ "Indonesia/Aceh (1949-present)". Political Science. University of Eastern Arkansas. اطلع عليه بتاريخ 07 يوليو 2015. ^ Stokke، Hugo؛ Suhrke, Astri؛ Tostensen, Arne (1997). Human Rights in Developing Countries: Yearbook 1997. The Hague: Kluwer International. صفحة 241. ISBN 978-90-411-0537-0. ^ "Being gay under Gaddafi". Gaynz.com. اطلع عليه بتاريخ 01 سبتمبر 2011. ^ Metz، Helen Chapin (1987). "Libya: A Country Study- Education". US Library of Congress. ^ Arditti، Avi (28 March 2007). "English Teaching in the Arab World: Insights From Iraq and Libya". Voice of America. ^ [استشهاد ناقص]"A New Flag Flies in the East". The Economist. 24 February 2011. ^ "Freedom of the Press 2009" (PDF). Freedom House. 2009. تمت أرشفته من الأصل (PDF) في 4 August 2011. اطلع عليه بتاريخ 07 مايو 2009. ^ [استشهاد ناقص]The New York Times. 20 August 1981. ^ Bright، Martin (28 March 2004). "Gadaffi Still Hunts 'Stray Dogs' in UK". The Guardian. London. ^ Wedeman، Ben (3 September 2011). "Documents shed light on CIA, Gadhafi spy ties". CNN. اطلع عليه بتاريخ 03 سبتمبر 2011. ^ "Files show MI6, CIA ties to Libya: reports". Sydney Morning Herald. 4 September 2011. اطلع عليه بتاريخ 04 سبتمبر 2011. ^ Spencer، Richard (3 September 2011). "Libya: secret dossier reveals Gaddafi's UK spy links". The Telegraph. London. اطلع عليه بتاريخ 03 سبتمبر 2011. ^ Martínez، Luis (2007). The Libyan Paradox. Columbia University Press. صفحة 71. ISBN 978-0-231-70021-4. Cordesman، Anthony H. (2002). A Tragedy of Arms – Military and Security Developments in the Maghreb. Greenwood Publishing Group. صفحة 2. ISBN 978-0-275-96936-3. ^ Shadid, Anthony (18 February 2011). "Libya Protests Build, Showing Revolts' Limits". The New York Times. اطلع عليه بتاريخ 22 فبراير 2011. ^ "Time to Leave – A Correspondent Reports from the Border Between Libya and Egypt". The Economist. 22 February 2011. اطلع عليه بتاريخ 23 فبراير 2011. ^ Peter Gwin (31 August 2011). "Former Qaddafi Mercenaries Describe Fighting in Libyan War". The Atlantic. اطلع عليه بتاريخ 25 يونيو 2012. ^ [http:// www.economist.com/node/18239888 "Endgame in Tripoli"] تحقق من قيمة |url= (مساعدة). The Economist. 24 February 2011. اطلع عليه بتاريخ 25 يونيو 2012. ^ "Gaddafi Defiant as State Teeters". Al Jazeera English. 23 February 2011. اطلع عليه بتاريخ 23 فبراير 2011. ^ "Middle East and North Africa Unrest". BBC News. 24 February 2011. اطلع عليه بتاريخ 24 فبراير 2011. ^ Casey, Nicholas؛ de Córdoba, José (26 February 2011). "Where Gadhafi's Name Is Still Gold". The Wall Street Journal. ^ "Security Council Approves 'No-Fly Zone' over Libya, Authorizing 'All Necessary Measures' to Protect Civilians in Libya, By a Vote of Ten For, None Against, with Five Abstentions". United Nations. اطلع عليه بتاريخ 19 مارس 2011. ^ "French Fighter Jets Deployed over Libya". CNN. 19 March 2011. اطلع عليه بتاريخ 19 مارس 2011. ^ "Gunfire, explosions heard in Tripoli". CNN. 20 March 2011. اطلع عليه بتاريخ 20 مارس 2011. ^ "Libya Live Blog – March 19". Al Jazeera. 19 March 2011. 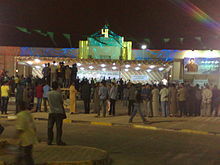 تمت أرشفته من الأصل في 19 March 2011. اطلع عليه بتاريخ 19 مارس 2011. ^ "Libye: "Mouammar Kadhafi avait choisi la voie suicidaire dès février"" [Libya: "Muammar Gaddafi had chosen the path of suicide in February"]. 20 minutes (باللغة الفرنسية). 20 October 2011. اطلع عليه بتاريخ 11 نوفمبر 2011. آخر تعديل لهذه الصفحة كان يوم 16 أبريل 2019، الساعة 14:20.